I haven't shared this publicly until now, but for the past several months I have had a severe mild obsession with finding wing back chairs. Specifically, I would like two wing backs to use as host and hostess chairs in our dining room. The following images are largely responsible for fueling my obsession. 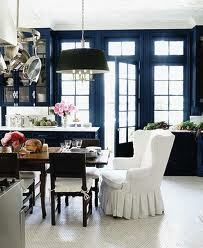 The ones I'm envisioning in my space are of the white slipcovered and skirted variety. But, we have 4 boys... and we drink red wine... and we have 4 boys. When I saw this dining room on Tessa's blog, my heart stopped. She has my dream chairs! Which, by the way, she found on craigslist. I kind of hate her a little bit. I seriously carry this picture around in my purse just in case I stumble upon some chairs and need to compare. Tell me... what's your latest obsession? Carolyn - funny I am looking for barrel type chairs and all I seem to find on craigslist are wingbacks! Good luck with the hunt. Oh I agree with you. They are beautiful! I don't blame you for wanting to find some. They would look so great in your dining room. I could never have them in mine because my room is too small. I think you need a good size dining room for them.....which you have. Good luck with your search. I'm sure if it's meant to be, they will find you! Ha! You could reserve them for just you and your husband to sit in so the boys wouldn't mess them up. I also love this look. Finding the right size is a challange. You are so funny. I sure hope you can find your cheap perfect dirt resistant chairs. Carolyn- I have a chair thing, too! That last picture is just gorgeous and I am going to pop over and visit that blog. I hope you find exactly what you want. I've got two at my dining room table, but that dirt resistant thing.... not so much. Let me know if you get a hot tip on that part. I hope you find the perfect chairs at the perfect price, Carolyn! This style will look beautiful in your dining room. Now you have ME wanting a pair...how beautiful! And Tessas are incredible as is her entire room!! Good luck in your quest! I've been looking for a long bench to use in my dining room.....that upholstered bench in one of your photos is perfect! Good luck with the chairs. Beautiful pics!!! I would love to have a pair for my dining room too! LOL Keeping my fingers crossed you find the perfect pair....SOON!!!! Good luck on your quest...the chairs of your dreams are waiting for you..
Where are you? We will help find you some!!! Ok thanks....Now you have passed your obsession on to me. 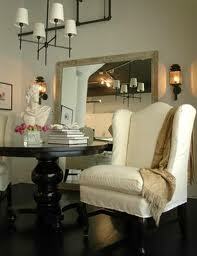 Never would I have thought to put wing back chairs at a dining room table but it looks AWESOME. I am loving that chunky leg, white table in the 2nd picture....it's love at first sight!! Hi Carolyn - that's the thing about Pinterest. It keeps us searching for that obiquitious object. My obsession is an olive jar - got to get one for the garden. Never heard of them till Pinterest, now I'm searching. But they are hard to find in Canada. Did buy a small tomatoe jar which is sort of the same thing, but much smaller. So the search continues. I know it is hard to give up the idea of white for the chairs, but don't let anyone tell you that it is a practical idea because you can throw slipcovers into the wash and bleach them and they are as good as new. WELL...you CAN wash them and you CAN bleach them, and they DO get softer, but they also get smaller! Even if you wash the fabric first and you hang them to dry, you will wrestle and wrestle to get them back on. It is not fun. I repeat...it is not fun. I have a client who wouldn't listen to me and did it anyway and she is soooooooorrrrryyyyy. I'm just sayin. I've been loving the look as well and am so glad I found my tufted wing backs here in Dubai - they'll be great to pair with my chairs in storage when we finally move from here. good luck in your hunt! A wingback chair requires multiple steps in the recovering process, and measurements are necessary for a good fit with your chosen fabric.